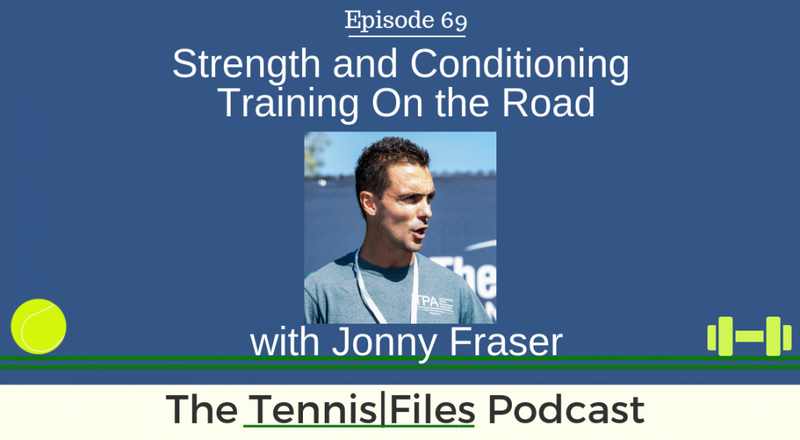 On Episode 69 of The Tennis Files Podcast, I spoke with Jonny Fraser about how tennis players should train when on the road. Whether we are top-ranked players or club players, we often find ourselves traveling to a different area for a tournament, USTA league competition, or match away from our home training centers, and don't know how we should train when away. Jonny and I discuss how you can best prepare yourself when heading to a different area or time zone, what to think about and prepare for before leaving, an awesome sample workout with exercises that you can implement into your training on the road, what equipment we should bring in our tennis bags (there won't always be a gym down the street! ), recovery tips, and much more. Jonny is a fantastic guy and I finally got to introduce myself to him at this past year's World Tennis Fitness Conference in Atlanta (shot out to Dr. Mark Kovacs and the International Tennis Performance Association!). Jonny has presented at this conference and others over the past several years, and I've always learned a ton from his presentations. I asked him to come onto the podcast then and we finally made it happen, which I am obviously very happy about! It was a pleasure speaking with Jonny on the podcast, and I know you'll really enjoy this episode and learn a lot about how we can perform better on the court through training effectively on the road. Many thanks to Jonny for coming onto the podcast! Let us know what you think about this episode in the comments below! [12:41] What exactly is sports science and how has it evolved over the years? [31:09] What resistance level (colors) of bands should we use when warming-up and training? [35:09] What level of intensity should players have when training on the road? [41:42] What is undulating periodization and should you use it in your training? [43:08] A sample workout from Jonny that you can use in your training! [49:56] Why Jonny created Science in Tennis, and what it aims to achieve. [55:45] Where can we follow you online or in person? [56:25] One key tip from Jonny to help us improve our tennis games!